Just recently we received a request to shoot for corporate TWO MEN AND A TRUCK. 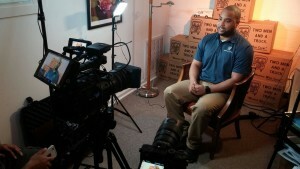 This corporate video shoot was to highlight an employee that was to receive an award given by the corporate office. The viewing was at the annual award ceremony. Many companies of all types of sizes use these types of events to support and establish communication in the company. The overall shoot was very straightforward and easily coordinated between the franchisee, the corporate office, and Safehouse studios. The shoot consisted of Jason Franco (owner-operator), and one PA (production assistant). To be quick on our feet we used a three access DJI Ronin gimbal, and the Sony FS7 with a 4 point lighting interview setup. In this industry, over the years we have learned that when people say, ”Corporate video shoot” people have the tendency to perceive it to be a difficult, overbearing video project. But, at Safehouse we have learned that the best approach in any type of shoot (corporate, commercial,etc.) it is our job to create a comfortable and enjoyable atmosphere. Whether shooting a high powered CEO, or a 560-pound tiger you always approach with an adaptable mindset.